“Even bad pizza is good pizza” is not just a platitude. It’s a lie. And on the Westside, “good” pizza can be hard to find. So Milo and Olive is really a fresh bubbling spring in Santa Monica’s murky pizza waters. When it opened, Milo and Olive had only minimal bar and communal table seating, so the 45 minute wait on a grimy Wilshire Boulevard sidewalk was something of a sacrifice. 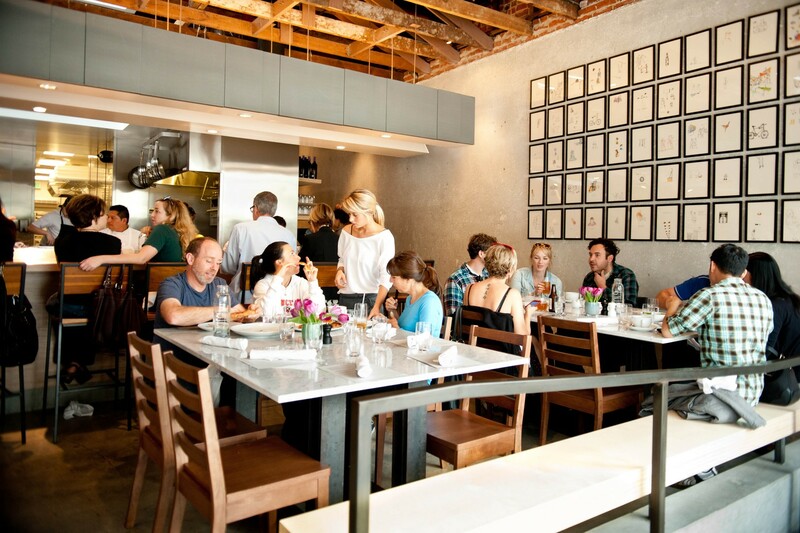 But the restaurant’s recent expansion alleviated the intense line and communal-table-only situation. This was big news for Santa Monica. We’re pretty sure even the people around here who haven’t eaten carbs since the year 2000 were excited. If you enjoy watching said meat, cheese, and vegetable-topped carbs go in and out of the oven, grab a seat at the bar. Otherwise, we advise putting on your best elastic waisted eating pants and settling into one of the tables with a nice glass of Italian red. As far as ordering goes, make it about the pizza. Feel free to supplement with some garlic knots, possibly a pasta, and maybe even a salad (this is Santa Monica, after all). But you’re here for pizza. Good pizza. Pizza dough topped with enough olive oil and whole garlic cloves to repel even the most desperate of dates. This slice of heaven is tied with twine and baked on a wood-burning oven. Think more of a “bunch” than a “knot.” This one’s getting added to the death row meal list. This pie, a Milo and Olive menu staple, is loaded with mushrooms sautéed in some sort of intense deliciousness and topped with lemon zest. It’s the girlfriend you call when you get dumped - reliable, dependable, and always there when you need her. Sometimes when you don’t. Very simple, but excellent at the same time. We’d also gladly order a jar of the lemon anchovy dressing and drink it. Pasta topped with cream, parsley, and parmesan. This should be your pasta order. We had such high hopes for this lasagna, but Milo’s lasagna is disappointing. It’s doused in flavorless sauce that drowns out the sausage and covers up any hints of the fontina cream. Skip. One bite of this pie, featuring the house-made sausage, is basically the taste equivalent of eating your first piece of pizza drunk. We would eat this pizza all day every day.